eAppendix -Download PDF (67 KB). This file requires Adobe Reader®. Providing Patients With Global Cardiovascular Risk Information: Is Knowledge Power? Background Global coronary heart disease (CHD) risk estimation (ie, a quantitative estimate of a patient's chances of CHD calculated by combining risk factors in an empirical equation) is recommended as a starting point for primary prevention efforts in all US adults. Whether it improves outcomes is currently unknown. Methods To assess the effect of providing global CHD risk information to adults, we performed a systematic evidence review. We searched MEDLINE for the years 1980 to 2008, Psych Info, CINAHL, and the Cochrane Database and included English-language articles that met prespecified inclusion criteria. Two reviewers independently reviewed titles, abstracts, and articles for inclusion and assessed study quality. Results We identified 20 articles, reporting on 18 unique fair or good quality studies (including 14 randomized controlled studies). These showed that global CHD risk information alone or with accompanying education increased the accuracy of perceived risk and probably increased intent to start therapy. Studies with repeated risk information or risk information and repeated doses of counseling showed small significant reductions in predicted CHD risk (absolute differences, −0.2% to −2% over 10 years in studies using risk estimates derived from Framingham equations). Studies providing global risk information at only 1 point in time seemed ineffective. Conclusions Global CHD risk information seems to improve the accuracy of risk perception and may increase intent to initiate CHD prevention among individuals at moderate to high risk. The effect of global risk presentation on more distal outcomes is less clear and seems to be related to the intensity of accompanying interventions. Coronary heart disease (CHD) is the leading cause of death in the United States.1 However, less than two-thirds of all people at increased risk of CHD based on elevated risk factors are using effective risk-reducing therapies (eg, antihypertensives, statins, aspirin).2-5 This has resulted in considerable interest and investment in strategies to improve CHD prevention efforts. Guidelines now emphasize the importance of estimating global CHD risk (ie, a quantitative estimate of a patient's chances of CHD calculated by combining risk factors in an empirical equation) as a starting point when considering using aspirin and cholesterol medication for the primary prevention of CHD.6,7 General CHD prevention guidelines also recommend that all adults older than 40 years know their global CHD risk.7 These latter recommendations are predicated on the hope that providing individuals with risk information will improve their risk perception and motivate those at moderate to high risk to accept and adhere to risk-reducing therapy. Whether providing global CHD risk information accomplishes these goals is currently unknown. Three recent systematic reviews have addressed the effect of personalized risk information on clinical outcomes.8-10 However, none has focused on the effect of providing personalized global CHD risk information to individuals. Two8,9 reviews investigated the effect of providing physicians with information on patients' global CHD risk. The third review10 included individually directed risk information but was focused almost exclusively on unrelated and often emotionally charged risks (eg, breast cancer risk) that would be expected to have very different impact than CHD risk information. To assess the effects of providing global CHD risk information to individuals, we undertook a systematic review to assess outcomes we considered to be in the pathway of potential impact: accuracy of risk perception, intent to start therapy, adherence to therapy, and reduction in CHD risk factors and predicted CHD risk. The final work plans for this review were developed in conjunction with a specially appointed work group comprising individuals from the 6 member institutions of the Centers for Disease Control and Prevention (CDC) Cardiovascular Health Intervention Research and Translation Network (CHIRTN). In collaboration with a medical librarian, we searched MEDLINE (1980 to December 18, 2008) using the MESH headings “cardiovascular disease” (major topic headings “epidemiology” and “prevention and control”), “patient education as a topic,” “communication,” “physician-patient relations,” “consumer participation,” “patient participation,” “community health services,” “community health centers,” and “community medicine.” We then searched PsychInfo, CINAHL, and the Cochrane Database using the keywords “cardiovascular,” “risk assessment,” “communication,” “patient relations,” or “education.” Each search was limited to studies in humans and to the English language. We also hand searched the bibliographies of all included articles, searched our files, and queried content experts. Because of the disparate indexing of relevant articles, we also performed related articles searches of all included MEDLINE articles. We excluded studies that were unrelated to global CHD risk, answered the wrong question about CHD risk (eg, they were related to secondary prevention; the development and validation of risk scores; the accuracy of systems to calculate CHD risk; the acceptability of decision aids including CHD risk; the cost-effectiveness of programs using CHD risk; or the understanding of various risk formats for treatment benefit information), used risk scores for an alternate purpose (eg, as part of the end points of a study but not as information for individuals), did not have a quantitative experimental design (eg, qualitative studies), focused on physician knowledge or actions in response to global CHD risk scores, only had an outcome that was not of interest (eg, attitudes about CHD prevention), used CHD risk in combination with other health risks presented to individuals (eg, as part of traditional health risk appraisal tools), presented hypothetical rather than actual risks, or were determined to be of poor quality (see the next subsection). Two of us (S.L.S. and A.J.V.) independently reviewed titles, abstracts, and, if necessary, full articles to determine inclusion. Disagreements were resolved by discussion. One of us (D.L.) abstracted study information into tables; 2 of us (S.L.S. and A.J.V.) then checked this information for accuracy. Two reviewers independently assessed study quality (L.E.S. and C.L.I. for the study by Sheridan et al11 and S.L.S. and A.J.V. for all others). After assessment of potential quality grading schemes for quantitative study designs,12-14 the CHIRTN Work Group decided on criteria adapted from the US Preventive Services Task Force and used in previous reviews.9,15-17 For each study, reviewers graded prespecified criterion (Table 1) as good, fair, or poor. We converted ratings for each item into numeric values (good = 2, fair = 1, poor = 0) and a composite rating for each study. We weighted each item equally, excluding items judged to be not applicable based on study design. We based final quality grades on averaged scores, with 1.5 or higher considered to denote good quality, 1.0 to 1.49 considered to denote fair quality, and less than 1.0 considered to denote considerable methodological limitations. After data abstraction, CHIRTN Work Group members met for discussion about results. They compared and contrasted relevant features of studies, giving priority to study design and size, and continued iterative review until reaching consensus about key messages and conclusions. No meta-analyses were performed owing to the heterogeneity of study populations, interventions, and outcomes. Overall, we identified 20 articles, reporting on 18 unique studies, for inclusion in our review (Figure). We identified 9 through our primary literature search and 11 through hand searching and searches of related articles. Ten studies gave participants a Framingham or a Framingham-derived risk score.11,19-21,23,25,26,32-35 Six studies used other risk scores (Dundee risk score,22 United Kingdom Prospective Diabetes Study risk score,24 Take Heart,31 Cardiovascular Health Life Expectancy Model,27 Family Heart Study Score,36 and International Cooperative Study Score28). One study did not use a formal calculator.29,30 One study18 gave participants 4 different risk scores (CDC, Arizona Heart Test, RISKO, Determine Your Medical Age), including 2 CHD-specific risk tools. Using these calculators, individuals in nearly all studies averaged moderate (6%-10%) to high (>10%) risk scores as defined by current US aspirin guidelines. Variations in baseline population risk levels did not change the conclusions of our review and are, therefore, not reported further. Included studies measured nearly all outcomes of interest. However, no studies measured the effect of global CHD risk information on aspirin use or actual CVD event rates. We found 1 RCT and 3 quasi-experimental studies (n = 913 participants) addressing the effect of global risk presentation on accuracy of risk perception (Table 2).18,19,23,27 All (including the RCT) examined the effect of global risk presentation on accuracy using preintervention to postintervention analysis. Three studies (n = 897 participants) examined the effect of global risk presentation alone or with a modicum of additional education. 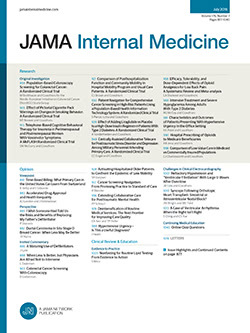 The largest18 (n = 732 participants), a population-based RCT designed to compare the effects of 4 risk appraisal instruments, demonstrated a 9% increase in the accuracy of designating oneself as lower than average, average, or higher than average risk (significance not reported) at 2- to 3-month follow-up. Two smaller clinic-based studies (n = 165 participants) showed similar sized improvements in subjects' accuracy in reporting their categorical risk. However, 1 (n = 40 participants)23 measured accuracy only indirectly, showing improvements in population perceived risk (absolute difference, 16%; P < .001); and the other19 (n = 125 participants), which stratified risk perception by level of risk, showed improved accuracy only for the low-risk group (n = 65 participants; absolute difference, 15%; P = .02), an effect that attenuated over a 1-month follow-up. A small quasi-experimental study23 (n = 16 participants) examined the effect of global risk information + counseling on the accuracy of risk perception. Consistent with the findings of other studies, this study showed improved accuracy of categorical risk perception (absolute difference, 43%; P = .03). It also showed dramatic improvements in participants' ability to report their exact CHD risk (absolute difference, 93%; P < .01). In aggregate, these studies suggest that global risk information, alone or with accompanying education or counseling, increases the accuracy of perceived risk. Although none of these studies included a “no risk presentation” control and effect sizes varied across studies, the best available evidence suggests that the expected improvement in individuals' ability to correctly categorize their risk is approximately 10%. Preliminary data suggest that the effect may be larger if accuracy is measured by individuals' ability to report a more precise quantitative estimate of their risk. We found 3 RCTs and 1 quasi-experimental study (n = 498 participants) addressing the effect of global risk presentation on intent to start therapy (Table 3).11,23,25,35 None examined the effect of global risk presentation alone. Two studies examined the effect of global risk in combination with CHD education on intent to start therapy. The larger of these 2 studies, a small (n = 87 participants) RCT11 that compared global risk + education with a list of risk factors provided in a clinical setting, showed that the combination of global risk information and education tended to increase intent to start therapy (absolute difference in proportion of individuals with a specific plan for CHD risk reduction who discussed it with their physician, 13%; 95% confidence interval [CI], −7 to 34%; regardless of whether they discussed it with their physician, 16%; 95% CI, −1% to 33%). However, results did not achieve statistical significance, likely owing to the small sample size. The second study, a small quasi-experimental study (n = 40 participants),23 provided only posttest intentions for therapy, limiting conclusions about the intervention's effect. One study examined the effect of global risk presentation in combination with counseling on intent to start therapy. This good-quality RCT (n = 154 participants),25 which compared the effects of risk presentation + repeated counseling with risk presentation and education alone, showed a statistically greater effect when risk was combined with counseling (absolute difference, 27%; P = .02). Notably, within-group increases in intent to start therapy in the risk + education alone group were similar in magnitude to those reported in studies of risk + education alone above (19% increase in exercise plans for risk and education alone). One study35 examined the effect of global risk presentation in combination with the results of decision analysis on intent to start therapy. This factorial RCT (n = 217 participants) showed increased certainty in the decision of whether to start hypertension therapy, but a trend toward less overall intent (relative risk [RR] for yes vs uncertain, 1.19; 95% CI, 0.59-2.40); RR for no vs uncertain, 3.15; 95% CI, 0.91-10.98). In summary, global risk presentation in combination with education increases intent to start therapy by approximately 15 to 20 absolute percentage points, with larger effect sizes when risk is combined with counseling instead of education alone. There are too few studies of global risk information combined with recommendations from decision analysis to determine the potential impact of this approach in clinical practice. We found 1 cRCT (n = 98 participants) addressing the effect of global risk presentation on adherence. This study24 showed a small, nonstatistically significant increase in adherence to decisions to take statins (adjusted odds ratio [OR], 1.9; 95% CI, 0.4-9.8) among those randomized to risk + education compared with those randomized to education alone. The study, however, provided its intervention at only 1 time point, analyzed adherence as a secondary outcome, and seemed to lack statistical power for this analysis. Of note, this study did report that risk + education reduced the number of participants missing a dose of statins in the past week compared with education alone (unadjusted OR, 3.4; 95% CI, 1.5-7.5). However, the lack of adjustment for baseline differences in CHD risk confounds interpretation of this result. We found 9 studies (n = 14 752 participants), including 6 RCTs, 2 cRCTs, and 1 observational follow-up of an RCT, addressing the effect of global risk presentation on predicted CHD risk (Table 4).20-22,25,26,28,31,33,34,36 None addressed the effects of global risk presentation alone. Intervention effects seemed to be related to the intensity of the interventions provided. One good-quality RCT (n = 3053 participants)20 that included repeated presentations of risk with a modicum of education showed a small, statistically significant reduction in predicted CVD risk at 1-year follow-up (absolute difference in 10-year predicted risk: −0.75%, P < .001). In addition, 1 good-quality25 and 2 fair-quality RCTs,33,36 which included repeated doses of counseling (n = 12 941 participants), showed small, statistically significant reductions in 10-year global CHD risk (on the order of 0.2%-2% over 10-12 months in the 2 studies using Framingham-based risk calculators25,33). One additional fair-quality RCT28 (n = 75 participants) with repeated risk presentation and counseling showed a trend toward global risk reduction (mean absolute predicted 10-year risk difference, −4%, using the International Coop Study calculator), which did not achieve statistical significance. Good-quality34 and fair-quality22,26,31 studies with interventions at 1 point in time showed negligible to small effects, regardless of whether global risk was presented with education alone or in combination with counseling. In summary, studies showed mixed effects of global CHD risk information on predicted CHD risk, which seemed to be related to the intensity of the intervention provided. Studies with repeated global risk presentation or repeated doses of counseling showed small significant reductions in 10-year predicted CHD risk (on the order of 0.2%-2% in studies25,33 using Framingham calculators), which would be clinically important (number needed to treat, 50-500) if applied across the population of moderate- to high-risk individuals. Recent guidelines have suggested providing all adults older than 40 years with their global CHD risk. Our review suggests that providing such information improves accuracy of risk perception and probably increases intent to initiate CHD prevention among adults at moderate to high risk. The effect of global presentation on other outcomes, including the more distal ones, is less clear. Apparent benefits of global risk presentation on predicted CHD risk (and lipid levels as reported in the online appendix) seem to be related more to the intensity of interventions than presentation of global CHD risk. Several fair- to good-quality studies demonstrate that providing global risk presentation at only 1 time point seems to be ineffective in promoting risk reduction.22,26,31,34 In addition, only a single study20,21 examined and demonstrated the benefit of repeated presentations of global risk (with a minimum of accompanying education) on predicted CHD risk and lipid levels. Current data preclude definitive conclusions on the effects of global CHD risk information on adherence, BP reduction, smoking cessation, and initiation of aspirin, diet, and exercise, although it should be noted that prevention guidelines for many of these outcomes (excluding those related to aspirin and lipids) are not currently risk based and may reduce the likelihood of finding an effect. An inherent challenge in interpreting this body of work is the diversity of study designs, interventions, and comparators of identified studies. The most direct evidence for the effect of global CHD risk would come from studies comparing global risk alone with usual care, global risk + education with education alone, or global risk + counseling with counseling alone. Unfortunately, few studies made such comparisons and several included no comparator. In addition, no study measured all of the outcomes that might be expected to be affected by global risk presentation. Given these issues, it is reassuring that our findings are consistent with behavioral theory37 and with recent systematic evidence reviews38,39 on the effects of health risk appraisal tools (which are designed to provide information on multiple risks to individuals in workplace settings). All suggest that risk information is not a panacea but rather a tool to be used in conjunction with other tools to promote adherence and risk reduction. Based on these findings, we believe clinical guidelines should continue to recommend that all individuals be informed of their global CHD risk as a way to improve individuals' accuracy of risk perception and their intent for therapy. It must be clear, however, that global risk information alone or in combination with usual care is not sufficient to achieve more distal clinical benefits. Global CHD risk seems most successful in promoting risk reduction when combined with repeated intervention in the form of either counseling25,28-30,32,36 or risk feedback.20,21 However, many potentially successful combinations of behavior change tools remain untested or undertested. For instance, none of the studies promoting medication use20,21,24,34 combined CHD risk information with use of effective adherence aids.40-42 In addition, few studies included global risk in decision aids,11,24,25 which might be easily disseminated in clinical practice with modest effort. More research is needed to determine the most efficacious and effective adjuncts to CHD risk information. Observations aside, we must consider potential limitations of our review. First, although we made rigorous and repeated searches, we may not have identified all relevant literature. Literature on global CHD risk is diversely indexed, making identification of relevant articles difficult. We also excluded non-English articles. Second, although our quality score has been vetted through a rigorous process and used in a number of systematic reviews, there is the potential for misclassification of quality because the score has not been formally validated. Despite these limitations, our review suggests that global CHD risk information might contribute to improved CHD prevention by increasing the accuracy of CHD risk perception and motivating individuals at moderate to high risk to plan risk reduction. In combination with repeated risk presentation or repeated counseling, it may also reduce predicted CHD risk and improve lipid levels. The effects of global CHD risk information on other outcomes, and in individuals at low risk and with low numeracy skills, need further exploration. Correspondence: Stacey L. Sheridan, MD, Department of Medicine, 5039 Old Clinic Bldg, CB 7110, University of North Carolina, Chapel Hill, NC 27599 (sls593@med.unc.edu). Accepted for Publication: September 7, 2009. Author Contributions:Study concept and design: Sheridan and Viera. Acquisition of data: Sheridan, Viera, Ice, Steinman, and Lungelow. Analysis and interpretation of data: Sheridan, Viera, Krantz, Ice, Steinman, Peters, and Lungelow. Drafting of the manuscript: Sheridan and Viera. Critical revision of the manuscript for important intellectual content: Sheridan, Viera, Krantz, Steinman, and Peters. Statistical analysis: Ice. Obtained funding: Sheridan. Administrative, technical, and material support: Krantz, Steinman, Peters, and Lungelow. Study supervision: Sheridan. CHIRTN Work Group on CHD Risk Members: Drs Sheridan, Viera, Krantz, Ice, and Peters; Mss Steinman, Kopin, and Lungelow; and Thomas C. Keyserling, MD, MPH, Annette L. Fitzpatrick, PhD, and Marsha Wilde, MPH. Funding/Support: The research reported in this publication was supported by the CDC's Prevention Research Centers Program (PRC) Special Interest Project (SIP 9-05), “The Cardiovascular Health Intervention Research and Translation Network (PRC CHIRTN),” through Cooperative Agreements U48-DP-000031 (University of Rochester, Thomas A. Pearson, MD, MPH, PhD, principal investigator [PI]), U48-DP-000054 (University of Colorado, Lucinda L. Bryant, PhD, MSHA, PI), U48-DP-000048 (University of Illinois, Chicago, Dr Peters, PI), U48-DP-000059 (University of North Carolina, Chapel Hill, Thomas C. Keyserling, MD, MPH, PI), U48-DP-000050 (University of Washington, Annette L. Fitzpatrick, PhD, PI), and U48-DP-000052 (West Virginia University, William A. Neal, MD, PI). The PRC CHIRTN is supported by the CDC's Division of Heart Disease and Stroke Prevention. Dr Sheridan's and Dr Viera's time was additionally supported via career development awards through the National Institutes of Health (NIH) (K23 HL074375 and KL2RR025746, respectively). Dr Krantz was partially supported by NIH grant U01 HL079160. Role of the Sponsors: The funding source had no role in the design, analysis, or writing of this work. Additional Contributions: We thank the CDC for its funding and other members of the CHIRTN Work Group on Global CHD Risk, including Thomas C. Keyserling, MD, MPH, Annette L. Fitzpatrick, PhD, and Marsha Wilde, MPH, for participation in early discussions about this work. The Working Group on Risk, Communication, and Healthcare Decision Making at the University of North Carolina reviewed an earlier draft of this manuscript, and Lindy Behrend, MPH, helped with formatting the manuscript. Disclaimer: The findings and conclusions in this report are the authors' and do not necessarily represent the official views of the CDC or other institutions with which the authors or work group members are affiliated.